It looks like no matter how many videogames, movies or casino games revolving around Cowboys and Indians will be developed, the audience will never get bored with them. With titles such as Western Frontier it is even less likely for slots enthusiasts to forsake Western themed games, because this one has everything that avid players look for in a game. First of all, it is important to mention that it is a five reel, 15 pay line slot game with a maximum wagering amount of 150 coins. This translates into potential winnings of as much as 36,000 coins, making it an excellent entertainment for highrollers. The rest of the players will probably wager amounts that are closer to the minimum bet of 0.01 coins, and savor the beautiful graphics and inspired sound effects. Don’t worry about being presented with black-and-white images, because visually Western Frontier is a slot game that is on par with any others depicting modern times. 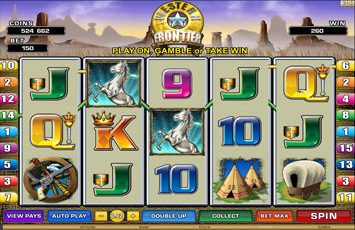 The hunt for bonuses has to begin with the Free Games Bonus, which has two stages that begin with the Indian one and concludes with the cowboy stage. The wild symbols are collected during the first stage and they influence the multiplier, which apply to the second stage and this makes it the most lucrative one. The profits are doubled by default, but those players who are not satisfied with these winnings and are willing to take some chances to increase them can always resort to the Gamble feature. The benefit of playing a game developed by Microgaming is that so many online casinos are powered by their software, therefore it should be no problem in finding a place to enjoy Western Frontier.